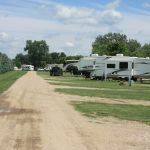 Ask fellow campers about "Yankton / Missouri River KOA" and nearby attractions. One of the nicest KOA we have stayed. Clean and well maintained. We had a long level pull thru gravel site with a patio, picnic table and firepit. Nice og park and great play area for kids. Cabin rental also available. Nice pool area. We did have to use an extension on our electric cord. Free wi-fi. Cable also available but we just used OTA and picked up 25 channels. Very quiet. Dirt road entrance is a little rough but otherwise is a great park. We camped at Yankton / Missouri River KOA in a Fifth Wheel. Nice park, large sites, level, cable available. Wifi worked well. Nice landscaping, grassed sites. We camped at Yankton / Missouri River KOA in a Motorhome. My 7/15 review gives a more detailed description of the park. We again had a level, pull through, FHU site with cable TV. The park still has numerous recreational facilities and the Wi-Fi was adequate. We camped at Yankton / Missouri River KOA in a Motorhome. We really enjoyed our stay at the Yankton/Missouri River KOA. It was easy to get to and our FHU pull-through site was very level and more spacious than most places we've stayed. Our coach was on gravel with a fire ring and picnic table on grass in between. We didn't check out the bathrooms or laundry facilities. Our Verizon jetpack worked fine but their wifi was even faster. Some sites had more shade than others and there is a pool, shelter area for get-togethers and a large playground area with a huge inflatable jumping trampoline. Cabins were also available to rent. I know KOA's can be pricey but this was very reasonable and we would definitely stay here again. We camped at Yankton / Missouri River KOA in a Motorhome. This was my first stay at a KOA (Kampgrounds of America), and despite the tepid remarks of many viewers, I'm finding it quite satisfactory. Certainly the staff was friendly and helpful. The campsite was open and spacious, although the site was not quite long enough to park my truck in front of the trailer after unhitching. The site and lanes were unpaved gravel, which were not a problem with the sunny weather. There was a concrete pad with table and fire pit. I also have better internet here, using the Parks public wifi. I know, I know, there be dragons here. But I have my VPN turned on, and that should deter any local hackers. My secure hotspot doesn't seem to work well with T-Mobile's hinterland service. I definitely would return if my travels take me back to southern South Dakota. We camped at Yankton / Missouri River KOA in a Fifth Wheel. It's a bit of a drive from Yankton, but the Ashfall Fossil Beds (http://ashfall.unl.edu/) are well worth visiting. Very clean park with many amenities. Because of the drought it seemed a little dusty and the grass was mostly dry. A few sites offered cement patios. Very spacious navigating and sites were level, long and wide. We enjoyed watching and were visited by 13-line ground squirrels at our site. It was hot and we enjoyed relaxing in the pool next to the covered pavilion, then bouncing on the "jumping pillow." Off-leash dog park and nice dog walk area. They issue a cable box so we had about 65 channels available to us. There's a small convenience store in the office with the usual camp items and souvenirs. Wifi was good and Verizon was mediocre. We would stay here again. We camped at Yankton / Missouri River KOA in a Fifth Wheel. A nice KOA near the Missouri Rive. I was just driving through and wanted one night in this area. State Parks required two nights, and I was able to get in here. People at the store/desk are very helpful, the site is FHU and everything is as it should be. The interior roads are fine and easy to navigate. The park is clean and attractive. Is expensive for this area, but wanted FHU and only one night. We camped at Yankton / Missouri River KOA in a Travel Trailer. Lots of construction on SD Hwy 50 in Yankton. Prepare for a slow bumpy road. As far as KOA goes this one is towards the top. The sites are spacious, it laid out in a way you don't feel like you are in a parking lot, and all everything is in good order and updated. They have a nice pool and jumping pillow for the kids. We stayed on a Friday night and it was quiet and not very busy. We would stay here again. We camped at Yankton / Missouri River KOA in a Travel Trailer. Friendly staff. Plenty of space to get your rig in. Quiet at night and close to everything in Yankton. We camped at Yankton / Missouri River KOA in a Fifth Wheel. With our one weeknight stay here in early July, I think we have stayed at every KOA in South Dakota during our 25 years of RVing. This park is only 5 years old an all its' facilities are modern. We had a level, gravel, FHU pull-through site with 60+ channel cable TV. Our site was satellite friendly but many are not. I believe all 56 RV sites are FHU with cable TV. 47 RV sites are pull-through and 9 are back-in. There are also 10 tent sites, 4 lodges, and 2 cabins according to their handout. The park was not quite full and there appeared to be some seasonal and/or extended stay customers. We got a good 802.11 network connection at our site. 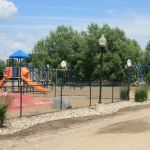 Recreation facilities include a nice pool, b-ball and v-ball courts, horseshoe pits, a playground, a covered picnic pavilion, and a bounce pillow. The bathrooms, showers, and laundry were in the main building. They were clean and adequate for this size park. The staff was friendly and helpful. Although the park is just half a mile off the main highway (SD 50), I could see not any restaurant or stores on that highway that were within walking distance of the park. Being well off the main travel routes (I29 and I90) in south east SD is the only big negative here for coming back to this park. I don't remember any recycling other than aluminum cans. We camped at Yankton / Missouri River KOA in a Motorhome. Easy enough to get to, all roads RV friendly. This was a stop over from Black Hills to Cedar Rapids. Staff was friendly and escorted us to our site, pull through large enough for 43' MH & TV. Site didn't have any shade, 97 degrees with 80% humidity. 50 amp kept tripping when running all 3 ACs, had to use only 2. Didn't try WIFI, but Verizon signal good, Directv good. Site had picnic table, firepit and was roomy enough for 4 slides, but no one was next to us. Pool looked good, but was 80+ so we stayed in AC. Would stop again for overnight, really nothing else around. We camped at Yankton / Missouri River KOA in a Motorhome. The park has an excellent host/manager. This is the most modern KOA we have ever stayed at. Not fans of KOA but this one is exceptional. This area is a great recreation area. We used this as a family destination/meeting campground. Very nice lodges and cabins. Excellent Wi-Fi and services. Would definitely stay again. We camped at Yankton / Missouri River KOA in a Fifth Wheel. Excellent park. I'd give a 10 if they had just a few organized activities for the kids. This place is immaculate and the staff was extremely friendly and helpful. Great pool, playground, pet park and jump pillow. Price reflects KOA discount. We camped at Yankton / Missouri River KOA in a Motorhome. This has been the campground disappointment of the year! Once we turned off the main highway we were on a very dusty dirt road. The registration parking is a dusty dirt parking area. The office is new & nice. The pool area is new & nice. The cabins are new & look nice. Unfortunately, everything else is dusty dirt and weeds. A lot of landscaping is needed. The RV sites are very basic and don't invite you to spend any time outside. Their longest sites are only 60' long. The park is way overpriced. We left after a day and went to the state park. We camped at Yankton / Missouri River KOA in a Motorhome. 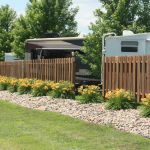 Are you affiliated with Yankton / Missouri River KOA ?